Background: The non-Newtonian pseudoplastic liquid flow through different types of the bend is more complicated compared to the simple straight pipe as the bends are associated with various curve geometry. Bends have wide application in bioengineering, biotechnology and biomedical such as study biofluids, blood rheology study, the design of medical equipment like equipment measuring the cholesterol etc. 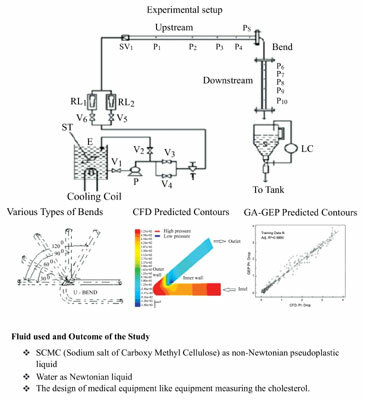 Method: The papers deal with the estimation of loss coefficient and frictional pressure drop of Newtonian and non-Newtonian pseudoplastic fluid flow through the different bend of 0.0127 m diameter pipe geometry using commercially available CFD software fluent 6.3. We revised all patents relating to the pipe flow through different types of bend. The present study also deals with the efficient application of Genetic Algorithm (GA) for optimization of frictional pressure drop. Laminar Non-Newtonian Power law model is used for Sodium Carboxy Methyl Cellulose (SCMC) solution to solve the continuity and the momentum equations numerically. Generalized input-output correlation has been developed by Gene Expression Programming (GEP) using Matlab. Results: The above-mentioned algorithm is used to predict and optimize the pressure drop. It has been found that, the process exhibit the minimum pressure drop across the bend under optimum condition (Angle = 133.160, Concentration = 0.2 Kg/m3 and velocity = 0.53 m/s). The effect of flow rate, bend angle, fluid behaviour on static pressure and pressure drop has also been investigated. Conclusion: From the study, it can be concluded that the developed GA model has a good agreement with the CFD model. The software predicted data might be used to solve various industrial problems and also to design different equipment. Bends, biotechnology, CFD, non-newtonian pseudo plastic fluid, flow structure, genetic algorithm.